As Marie Haxby talks to a co-worker at Scheels All Sports, she rocks back and forth on her feet. It’s a natural motion considering what she’s wearing. Haxby is one of the growing number of people who wear the new Skechers Shape-ups, a rounded-sole tennis shoe that promises improved posture and tighter muscles. The rounded-sole shoes are new to Skechers, but the concept has been around for a while. suffered injuries to the back or joints. The MBT is designed with a curved sole, creating an unstable foundation that works the muscles and improves posture. Kevin Jones, a manager at Scheels, said when the MBT craze first hit the United States, Scheels sold the shoes. They didn’t do well. “We had them before the craze really got here,” he said. 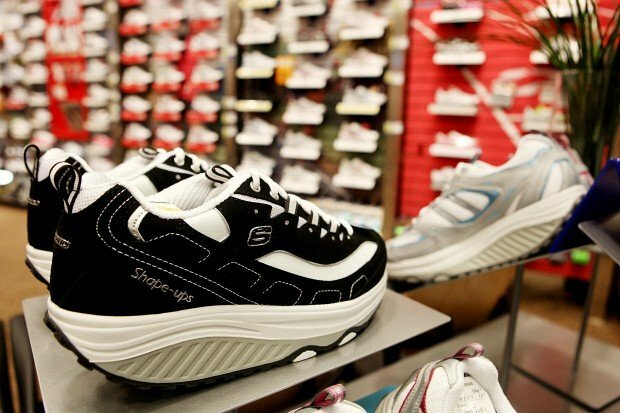 Scheels doesn’t carry the MBT shoes today, but it does carry the Sketchers version — the Shape-ups. Avia also has an MBT-style shoe called the Avi-Motion shoe. Haxby bought her first pair of Shape-ups in late February and quickly fell in love with them. “I can tell they are tightening,” she said. Haxby also believes the shoes have helped to align her knees and posture. She wears them whenever she’s at work and goes barefoot at home. Dr. Jennifer Ryder, a Rapid City podiatrist, admits she doesn’t know a lot about the shoes, but believes such a design would work the muscles differently than regular tennis shoes. “It’s definitely a learning curve in using them, and they would make your muscles work differently,” she said. But Ryder suspects the muscles adapt quickly and the muscle-toning benefits probably plateau within a short time. “I don’t think it would be long term,” she said. She also cautions people with certain health conditions, especially problems with the Achilles tendon or the heel, that wearing the MBT design could exacerbate those issues. Jones admits the shoes take some adjustment. “You have to break your body into the shoe,” he said. And he suggests that anyone with health issues, including joint problems, talk to a doctor before using the shoes. “We suggest good health from top to bottom,” he said. Haxby said other wearers tell her they had sore muscles for the first weeks after they wore the shoes. She was lucky. She wore them from the start without any adjustment or muscle pain. And she’s been so happy with the shoe that she’s already shopping for another pair in a different color. “I’m sold on them,” she said. Contact Lynn Taylor Rick at 394-8414 or lynn.taylorridck@rapidcityjournal.com. Roberta Hoyt pulls on a pair of Vibram FiveFingers and holds her foot out for inspection.